So next up in my Slaydies Series is none other than Christine Holthus or better known as milsimmedic5! 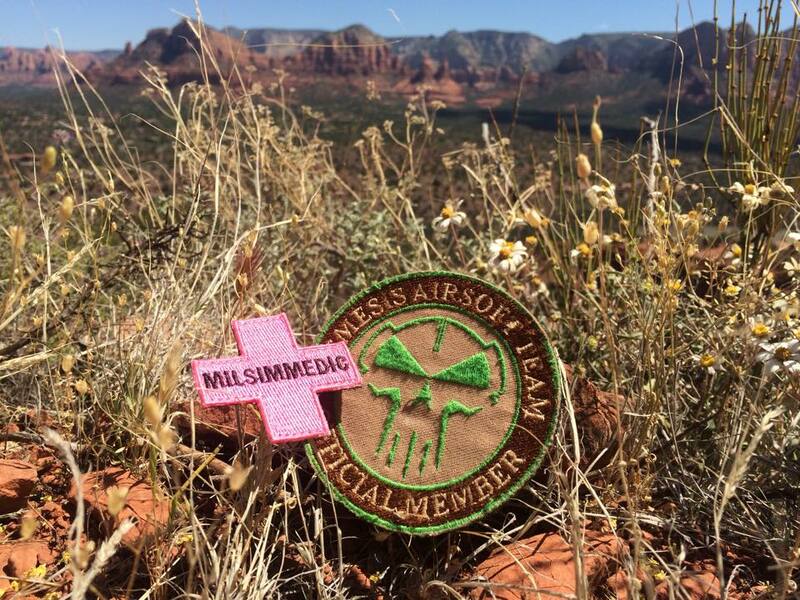 Christine is one of the amazing supportive female Airsofters that I have met through Instagram, hear what she has to say! Thank you for taking part in my Slaydies Series Christine! Can you tell my readers about your Airsoft background? What originally got you into Airsoft? Where is your home site? What are the most memorable sites you've played? I have been Airsofting for 4-5 years as a member of the Nemesis Milsim Airsoft Team based in the Chicagoland area of Illinois. It was my fiancé, and Nemesis Team Captain, who originally got me into the sport. At the time, I was playing softball in College and had almost no interest in the sport. 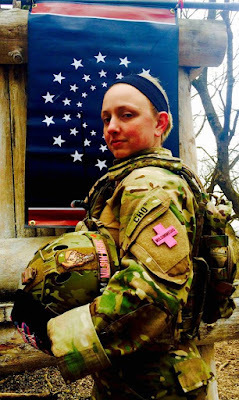 I felt that Airsoft was his hobby and I didn’t want to intrude on what I perceived to be his “guy time.” In addition, I’d never heard of any girls that played airsoft and stepping onto an airsoft field as the only girl felt very intimidating. However, my fiancé continued to ask me to come to team practices with him and when I finally gave in, I discovered I loved the sport! One of the most memorable sites I have played at was the Las Playas Training Center in New Mexico at American Milsim’s Operation Copperhead I. Las Playas was a copper mining town, which was opened during the 1970’s in the middle of the desert, close to Mexico’s boarder. The site was deserted in 1999 and has since been used for training by the armed forces. In fact, some parts of the town have been reconstructed to mimic Afghan villages. We even discovered that Warner Brothers Studios filmed part of the new Batman vs. Superman movie there. It was truly a one of a kind experience that not many people can say that they’ve had. The second most memorable site I’ve played at would have to be the Government Training Institute facility in South Carolina at American Milsim’s Operation Faded Giant III. The site was a uranium enrichment facility for nuclear warheads and the buildings themselves have so many levels, twists, and turns that it is veryyyyy easy to get lost and disoriented if you’re not careful. This also means that you can never say with confidence that your team has control of any part of the AO and you always have to be on your guard no matter what room or corridor you’re in. My home site is at Promisedland Paintball field in Trevor, Wisconsin. My Team hosts events, practices, and sometimes just hangs out at this field. The terrain of this field is very challenging because it has several steep hills and is a great place to play if you’re looking for a fun woodsball game. There is also a spring-fed swimming hole onsite with a private beach, which is a great feature to have on hot summer days. The thing that I love most about airsoft, besides the game play and intense firefights, are the friendships I’ve made and the people I’ve been able to meet because of the sport. Every time I go to a game, I feel like I’m going to a family reunion and I love that airsoft has allowed me to connect with people who love the sport as much as I do. My favourite game play style is definitely CQB. I love how fast-paced and intense it is. I’m the type of player that thrives in high-stress games that test athleticism. In fact, I am usually so active on the field that there aren’t many times where you won’t see me running during an Op. Which is probably why the Medic role suits me. Tell us about your favourite weapons and Loadouts! My weapons of choice would be my Krytac CRB and my KWA M9. Since I’m a Medic and am usually really active on the field, my loadout is built to emphasize speed over firepower. I run an LBT 6094 plate carrier with a Blue Force Gear 10 Speed and Mini-Map. I wear Propper Pants, a 5.11 Combat Shirt, and a pair of Vasque 2.0 GTX Breeze boots. However, my favourite piece of equipment is my hot pink kydex holster for my KWA M9 pistol. 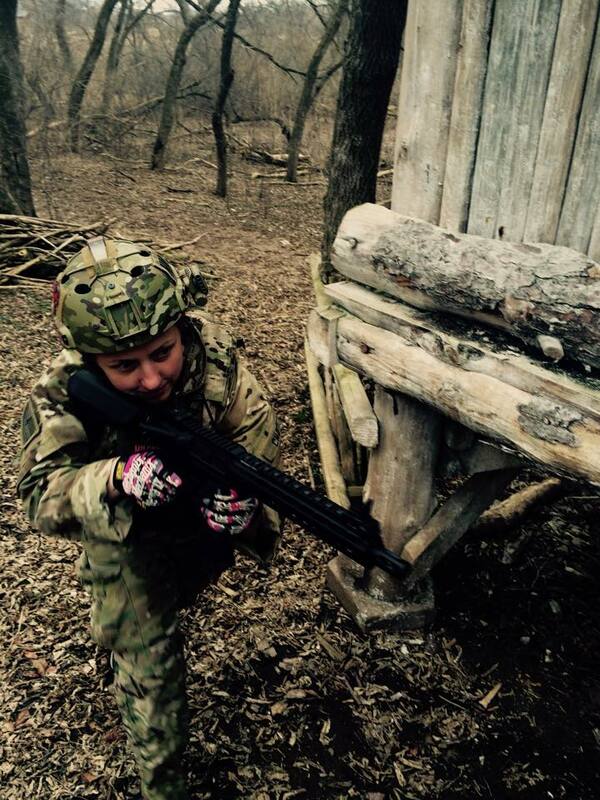 Before I had my holster made, most players didn’t even realize I was a girl because my bump helmet covers my hair. However, the holster is so noticeable that it has definitely become my signature and also how a lot of people recognize me on the field. 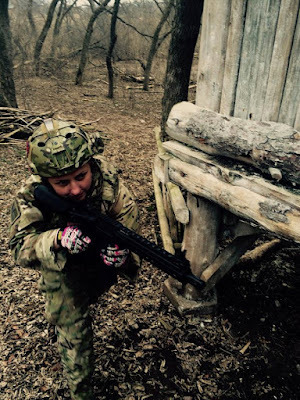 Being a woman in Airsoft: Do you feel you are treated differently because of your gender? If so, how do you deal with this? I don’t feel that I’m treated differently because of my gender, but I do feel that guys are surprised when I perform well on the field. 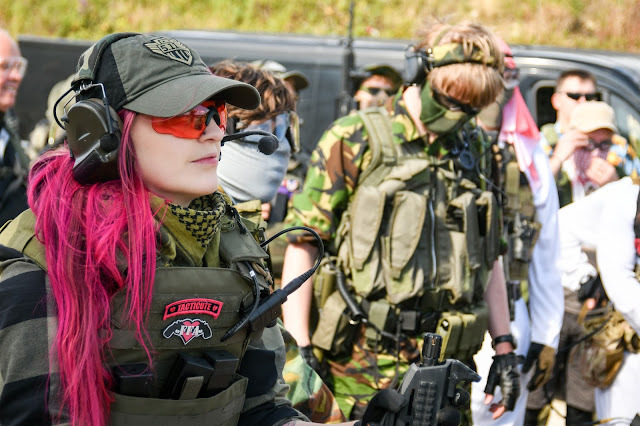 Its true, that women are definitely in the minority of the airsoft world, but I feel that this is slowly starting to change as women gain more visibility in the sport. And finally! Your thoughts - do you have any advice or anything you want to say to other Airsofters out there? One of the questions that guys ask me all the time is “how can I get my fiancé, girlfriend, or wife to play airsoft?” When I think about my answer, I remember the time when I was first starting to get into the sport. My fiancé didn’t take “no” for an answer and continued to ask me to come to team practices. Lesson #1; persistence pays off! He also took on the role of being both a coach and a mentor to me when I was on the field and didn’t just leave me to my own devices right away. Lesson #2; gaining confidence on the field and being comfortable as an individual player takes time and is not something that typically occurs right away. And finally when it came to gear, my fiancé provided me with suggestions, truly thought about what would work for ME, and connected me with a lot of players who agreed to let me try out their gear so that I could find what I liked best. Lesson #3; the gear that works for male Airsofters, will not always work for female Airsofters. I’ve seen so many girls on the field who are new to the sport that look almost identical to their boyfriends/husbands/fiancés. I think a lot of male players inadvertently make mini versions of themselves by outfitting their female counterparts in gear that they use, mostly because its familiar and what they know. Thus, I’ll conclude with challenging all the men in the hobby and even airsoft companies to find and make gear that is better suited to women. Her Facebook page is https://www.facebook.com/MilsimMedic and her Instagram account https://instagram.com/milsimmedic5/. 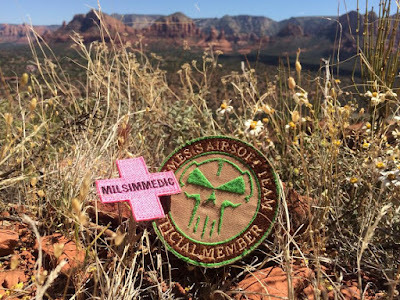 If you’re interested in learning more about her team, Nemesis Milsim, you can find us at https://www.facebook.com/nmairsoft?fref=ts&ref=br_tf.